The Venerable' Bede was a monk of Wearmouth and Jarrow in Northumberland who died in 735. He was one of the most learned men of his time in the whole of Europe. He wrote books on a variety of subjects, but was especially concerned with the interpretation of the books of the Bible. 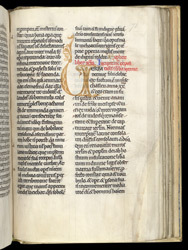 This copy of his Commentary of Ezra was written at the Augustinian abbey of St. Mary's, Cirencester. The ochre initial 'U' marks the start of Book III. In the left margin readers have written a monogram made up of the letters 'N o t a' ('take note! '), and 'D.M.' (short for 'dignum memorie', or 'worthy of memory').